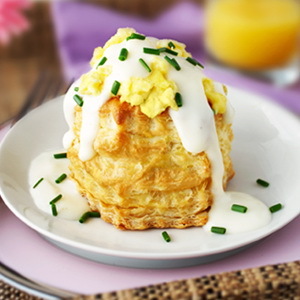 Prepared puff pastry shells are filled with tender scrambled eggs and crowned with a savory cheesy sauce. Served as an elegant brunch dish, or for a special Sunday night supper, this dish is sure to please. Heat 2 tablespoons butter in a 2-quart saucepan over medium heat. Add the flour and stir for 1 minute or until the mixture is smooth. Slowly whisk in 1 1/4 cups milk. Cook and stir for 2 minutes or until the mixture bubbles and thickens. Gradually stir in the cheeses. Cook and stir for 5 minutes or until the mixture is smooth and the sauce begins to bubble. Cover the saucepan. Set aside and keep warm. Beat the eggs and remaining milk in a medium bowl. Heat the oil and remaining butter in a 10-inch skillet over medium heat. Add the eggs. Cook and stir until the eggs are set but still moist, stirring occasionally. 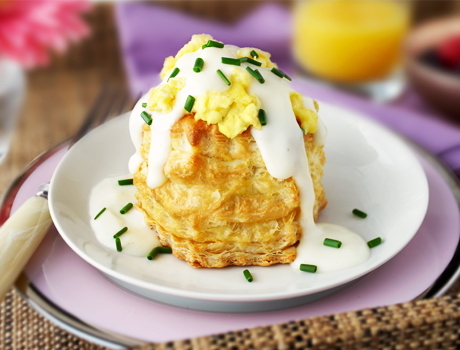 Divide the eggs evenly among the pastry shells. Top each with about 3 tablespoons cheese mixture and sprinkle evenly with the chives. Make-Ahead: The cheese sauce can be made ahead and stored in a tightly sealed container in the refrigerator for up to 2 days. Reheat over low heat, stirring constantly.